Mobile users spent nearly $60 billion in apps during 2017 on the App Store and Google play, but which apps and publishers contributed most to that total? In this report, we present last year’s top mobile apps, games, and publishers according to Sensor Tower Store Intelligence data. Netflix was the world’s top earning non-game mobile app in 2017, claiming the top spot held by Spotify in 2016 and LINE the year before that. The streaming video giant saw gross subscriber revenue of approximately $510 million last year according to our estimates, representing a huge year-over-year increase of 138 percent, or about 2.4 times the $215 million users spent in the app during 2016. 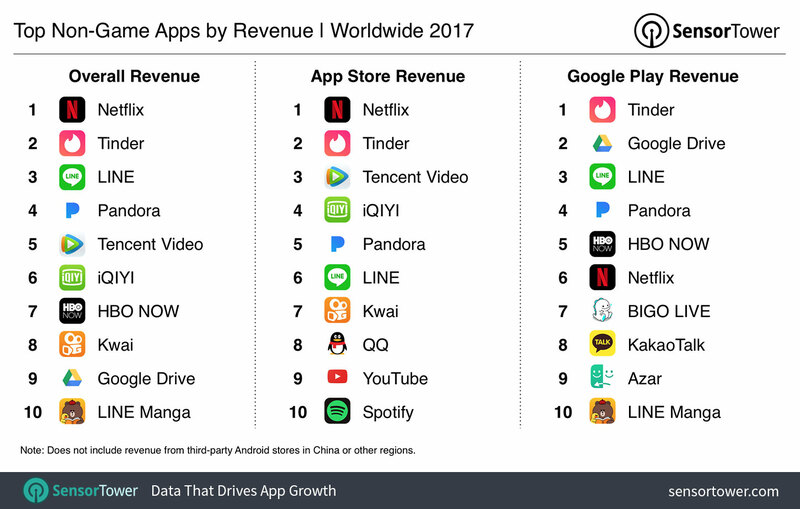 Netflix was also the highest grossing non-game app on Apple’s store, while it ranked below HBO NOW on Google Play, where IAC’s Tinder was the top app by worldwide revenue. Tinder ranked No. 4 in 2016, while HBO NOW was the fifth highest grossing non-game app that year on the platform. 2016’s No. 14 ranked non-game app by revenue, Tencent Video, grew tremendously over the past 12 months, ranking fifth overall for 2017 and No. 3 on Apple’s App Store. 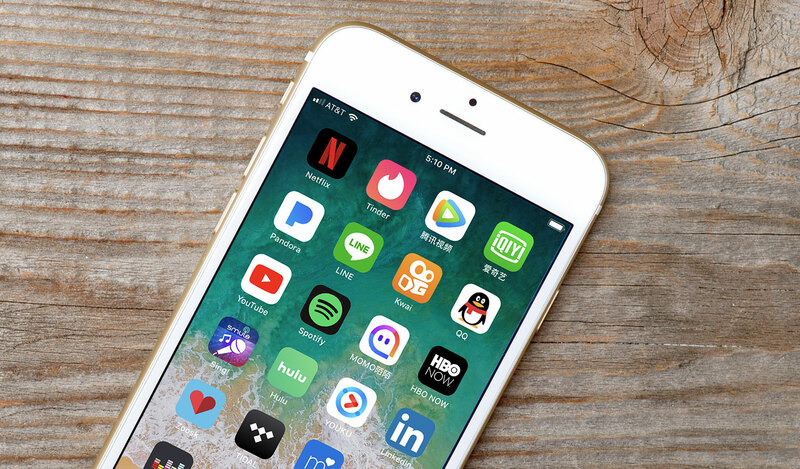 The app didn’t make the top 10 on the Play Store, which is expected as Google’s platform is not available in its largest market, China. 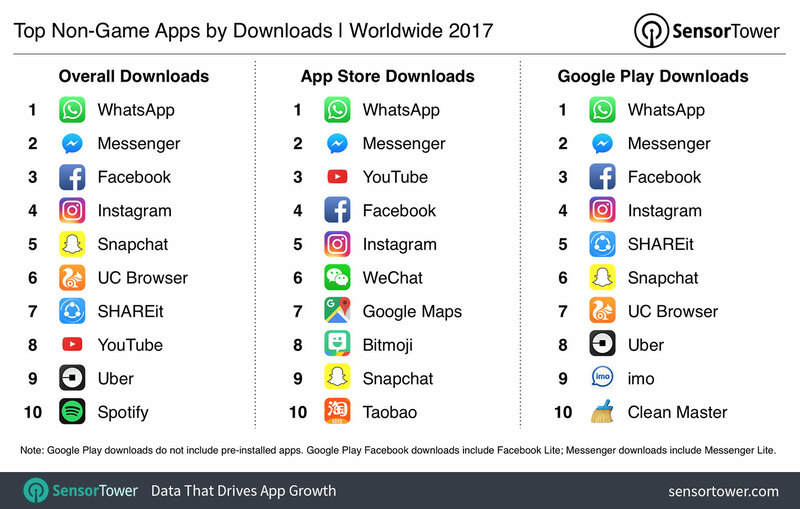 In terms of first-time app installs per App Store or Google Play account, it was Facebook-owned WhatsApp at the top, swapping places with the core Facebook app which occupied the No. 1 spot in 2016. While Facebook apps continued to dominate the top of the overall and Google Play download charts, the same wasn’t the case on Apple’s store, where Google’s YouTube was the No. 3 most installed app last year. 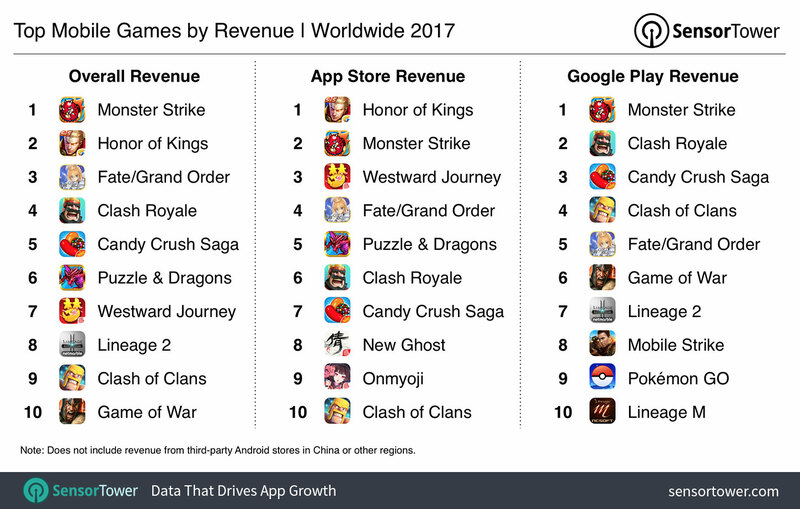 Mixi’s juggernaut Monster Strike was the world’s top grossing mobile game—and, indeed, the highest earning mobile app overall—for the third year in a row. Tencent’s Honor of Kings occupied second place, but only because Google Play isn’t available in China, the game’s largest territory. 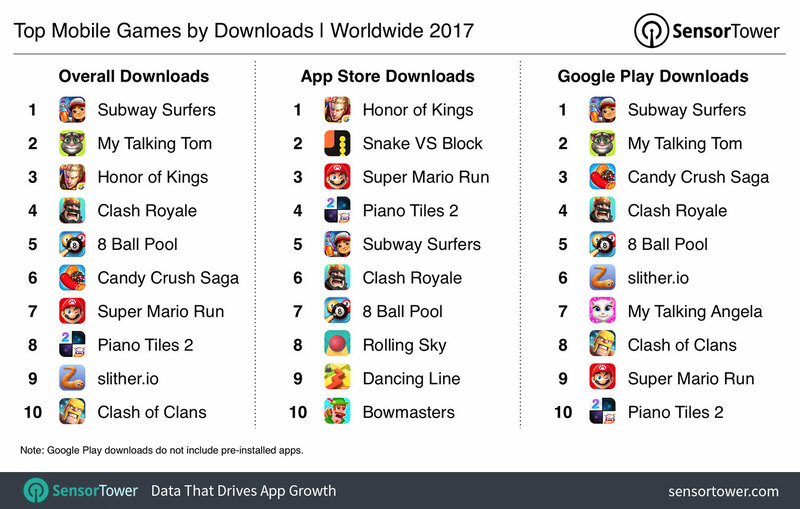 Many of the games occupying the top 10 overall and per-platform predate 2017, including King’s Candy Crush Saga, which, at five years old last year, still managed to reach the top five. Last year’s global sensation Pokémon GO didn’t crack the overall or App Store revenue top 10, despite sustained efforts by publisher Niantic to reignite the frenzy of 2016 with new Pokémon and other content, but did appear at No. 9 on Google Play. Google’s platform also saw two separate Lineage titles—Netmarble’s Lineage II: Revolution and NCSOFT’s Lineage M—ranked at No. 7 and No. 10, respectively. Kiloo’s Subway Surfers was the most installed mobile game worldwide last year, a distinction that went to Pokémon GO in 2016. It was also Google Play’s most downloaded game, while on the App Store that accolade went to Tencent’s Honor of Kings, released in the West last month as Arena of Valor. 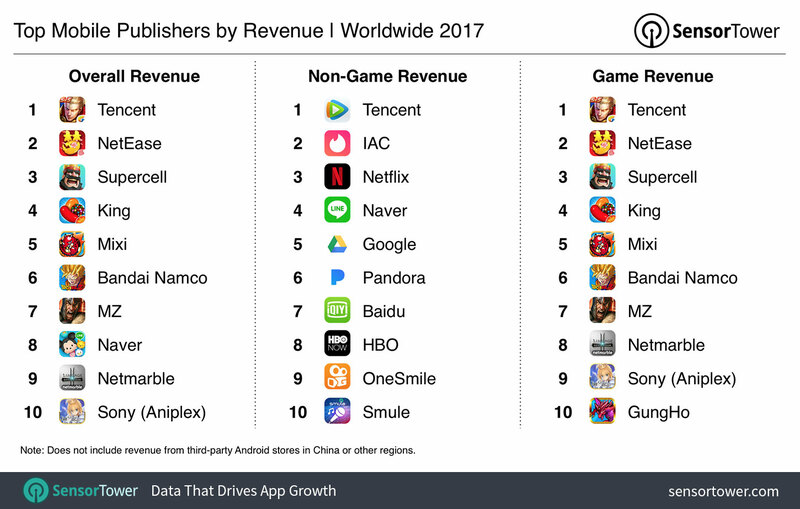 Tencent was the world’s top earning mobile publisher in terms of both non-game and mobile game revenue last year, with the aforementioned Tencent Video and Honor of Kings as its standout apps in those categories. NetEase, Supercell, King, and Mixi rounded out the top five grossing publishers overall. Meanwhile, the second to fifth spots in terms of non-game revenue were occupied by IAC (Tinder), Netflix, Naver (LINE), and Google, respectively. Facebook unsurprisingly dominated the overall and non-game download rankings again last year, with Google in the No. 2 position. Tencent led mobile game downloads and placed No. 3 overall. Snap managed to rank No. 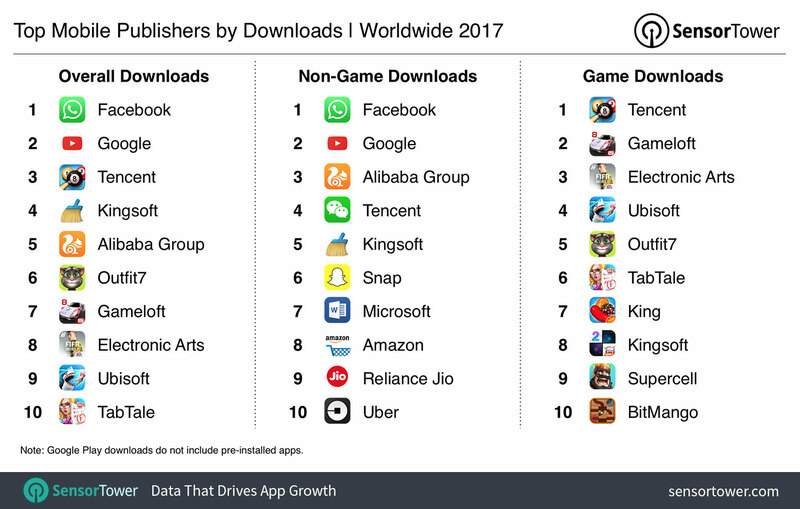 6 for non-game downloads despite declining installs of Snapchat in the United States, while Alibaba Group grew on escalating adoption of its UC Browser in Asia and Indian mobile provider Reliance Jio ranked No. 9 in the non-game category as its MyJio app increased in popularity there. We’ll have additional insights into the app economy during 2017 in our upcoming Q4 2017 Store Intelligence Data Digest, which will also delve into the top mobile app categories from the past year. Follow us on Twitter to learn when the report becomes available. Sensor Tower’s Store Intelligence platform is an Enterprise level offering. Interested in learning more? Request a live demo with our team!